Understanding the necessary requirements for your product’s enclosure ratings is important, particularly when looking to gain the optimum life from your product while avoiding any safety concerns. Included below is a straight forward easy to understand overview of enclosure ratings, including NEMA types, IP ratings, and the difference between the two. We will be looking at these two common standards for industrial enclosures, what they equate to, some alternatives, and how to best choose the right one for your application. 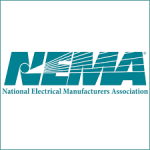 NEMA stands for the National Electrical Manufacturers Association, one of the largest trade associations in the United States related to electrical equipment and medical imaging manufacturers. A NEMA rating is a standard created by NEMA concerning how well an enclosure protects against ingress in response to exposure to things such as liquids, dust and/or corrosive chemicals. A complete listing to a detailed overview of NEMA enclosure types can be reviewed on their website. A NEMA rating incorporates a number, and possible letter combination, that dictates the degree of protection from hazardous parts and foreign objects, such as: dirt, water, dust, oil and/or coolant etc. For example a NEMA Type 1, or NEMA 1, enclosure refers to a general purpose enclosure ideal for general indoor use with the lowest protection against the items listed above. NEMA type 9, or NEMA 9, is a Class II indoor hazardous location explosion-proof enclosure to be used for E, F or G environments. Below is a table that provides an outline of the NEMA standard for enclosures as provided in the link above, highlighting the basic protection provided by each NEMA type. This table can also be found in the Reference Tables section of the Dwyer Instruments, Inc. catalog. 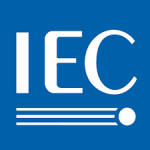 The International Electrotechnical Commission (IEC) is a non-profit, non-government entity that creates international standards for electrical and electronic related technologies. This organization is responsible for Publication 60526 or IEC Publication 60529 Classification of Degrees of Protection, which is also referred to as the IP code. The IP code or Ingress Protection ratings are defined in international standard EN 60529 and used to describe how well an enclosure protects against liquids and solids, such as dirt and moisture. The complete IEC 60529 standard can be found here. With the IP code, the first number is related to protection from solid intrusion while the second number is related to the level of protection from liquid intrusion. For example, an enclosure with an IP67 rating refers to a dust tight enclosure protected against immersion for up to 1m depths. Below is a table that provides an outline of the IP standards for enclosures. There are instances where manufacturers will list their products as weatherproof or explosion-proof without necessarily listing a NEMA or IEC “IP” rating. These products may have been tested to alternative standards, such as Underwriters Laboratory (UL) standards, but do not necessarily conform to a specific NEMA type or IP rating. 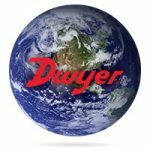 This may also be applicable to an application that calls for a general confirmation that the unit can withstand basic outdoor environmental factors, such as rain or indoor wash-down applications. 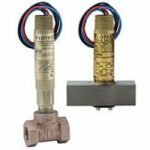 For example, Dwyer Instruments, Inc. Flotect® Flow Switches feature weatherproof enclosures. Weatherproof is a term used to describe a unit that was tested by the Underwriters Laboratory and proven to withstand water exposure by performing a Hosedown Test according to SEC. 35 OF UL 5. In this test, samples of the enclosure are sprayed with hose water at a definite flow rate and a specified distance for a quantified duration at the joints. If a product is listed as weatherproof or explosion-proof with no specific ratings, be sure to request the method for testing. You may find that the unit still fits your application needs without a specific NEMA or IEC “IP” rating. This can save both time and money. IEC Enclosure Classification Designations or the IP code rating only focuses on protection against solids and liquids and does not specify protection capabilities against instances of explosions, condensation, or corrosive vapors as NEMA does. Consequently even though NEMA tends to be amore of a U.S. standard, in comparison to the IEC standard of IP, it cannot easily be converted from one enclosure type to the other. An example of this would be when converting a length measurement from feet to meters. 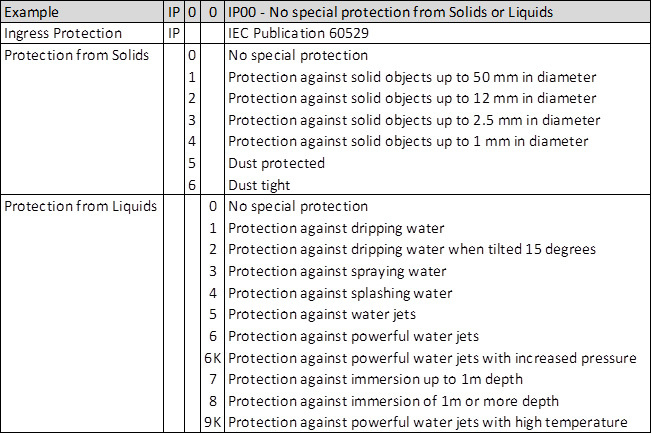 As can be seen above, NEMA 1 (general indoor use) may equate to IP00 (no special protection from solids and liquids),but IP66 (dust tight and protection against power water jets) does not translate to NEMA 4X (dust tight with protection against hose directed water and corrosion resistant). Nonetheless, as NEMA does include additional degrees of capabilities, you can typically cross over NEMA to some level of IP, but not IP to NEMA. There is unique protection that NEMA tests for that IEC does not. Accordingly, using the example above, if you have a NEMA 4X enclosure (dust tight with protection against hose directed water and corrosion resistant) that would suffice for an IP66 type enclosure (dust tight and protection against power water jets). It is imperative to first understand the requirement of your unique application. General use indoor applications will call for vastly different requirements than units placed outdoors in hazardous environments. Understanding these requirements and the difference between enclosure ratings will save not only money, but will avoid premature product failure and prospective safety concerns.